Guam’s Electric Island Festival is a swirling, dancing mass of color and music that doesn’t stop spinning until the dark, early hours of the morning. In 2013, the leaders of the electronic music scene launched Guam’s inaugural EIF featuring the island’s local DJs and international acts. The thumping party at Gun Beach was fueled by a new generation of dancers and revelers, hungry for the glow of neon and the bounce of a new beat. Since then, the yearly event has grown to become the destination for thousands of party-goers, and organizers hope future EIFs will be bigger and better. This year, 6AM Group and Tropical Productions brought DJs from Taiwan, South Korea, Philippines, and the mainland United States to the riverside of Paseo de Susana Park in Hagåtña for the island’s biggest electronic music festival. DJs started spinning while it was still light out, but as the sun started to set, early revelers were treated to one of Guam’s most famous natural features: a spectacular sunset. As DJ Clyde Harris got his set started, and local artists painted designs on the arms and faces of the first group of guests, the sky lit up in brilliant pinks, purples and oranges, casting palm trees beyond show grounds in dramatic silhouette. Partygoers trickled in throughout the evening, but the party didn’t truly start picking up speed until well after 10pm, as a line of guests started to wind out the gates. By the time Taiwan-based DJ Cookie took the main stage, a nice crowd of dancers, swept up in the volume and the vibe were bouncing as one many-handed interconnected mass of people and glowsticks.. 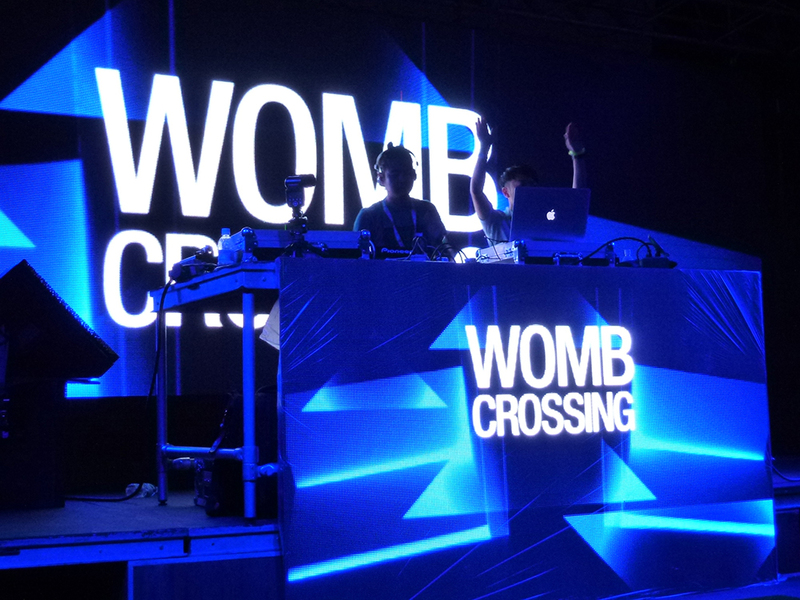 This year, the festival set up a second stage, Womb Techno featuring underground electronic music, played by local DJs and Takkyu Ishino, Ken Ishii, Ko Kimura, Sugiurumn, Techriders from award-winning club Womb Tokyo. Organizers prepared for the large volume of people, both locals and tourists alike. Those in need of hydration, delicious edibles and energy drinks had many vendors to choose from to replenish their reserves and keep on dancing. Throughout the evening, local eateries and bartenders were on hand, serving up the goods to keep bellies full and mouths happy. Guests were encouraged to ride from their hotels in Tumon to the venue aboard a shuttle bus, relieving the parking capacity at the Paseo and allowing revelers to party responsibly. The show is open to guests 18 years old and up, but those of legal drinking age are able to enjoy adult beverages at their leisure. 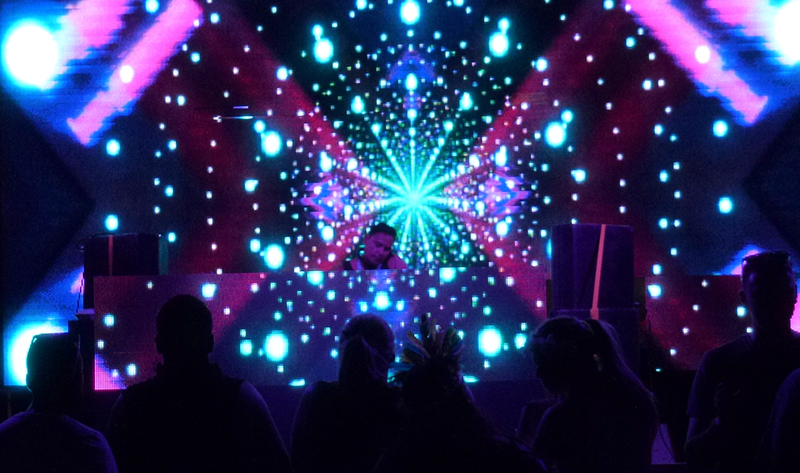 While the DJs, including headliner Starkillers, were stars of the show, and a spectacular fireworks display lit up the sky late into the night, the real entertainment was provided by the dancers. 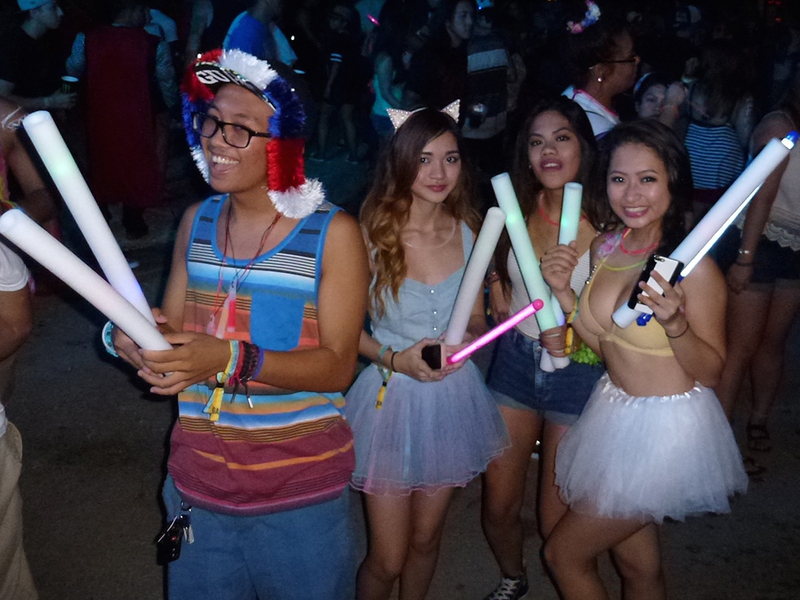 Every year, party goers bring their psychedelic neon and day-glo fashion game. They dress in animal masks, head-to-toe spandex suits, fluffy tutus and 1990’s era JNCO brand baggy jeans.